Evolutionary biologists from Cornell University have discovered that just about every vertebrate on Earth — including humans — descended from an ancient ancestor with a sixth sense: the ability to detect electrical fields in water. About 500 million years ago there was probably a predatory marine fish with good eyesight, powerful jaws and sharp teeth roamed the oceans, sporting a lateral line system for detecting water movements and a well-developed electroreceptive system to sense predators and prey around it. The vast majority of the 65,000 or so living vertebrate species are its descendants. A few hundred million years ago, there was a major fork in the evolutionary tree. One lineage led to the ray-finned fishes, or actinopterygians, and they’ve kept a weak electroreceptive system to this day. Sturgeon have got receptors in the skin of their heads, for example, and the North American paddlefish has 70,000 receptors in its snout and head. The other lineage led to lobe-finned fishes, or sarcopterygians, which in turn gave rise to land vertebrates. 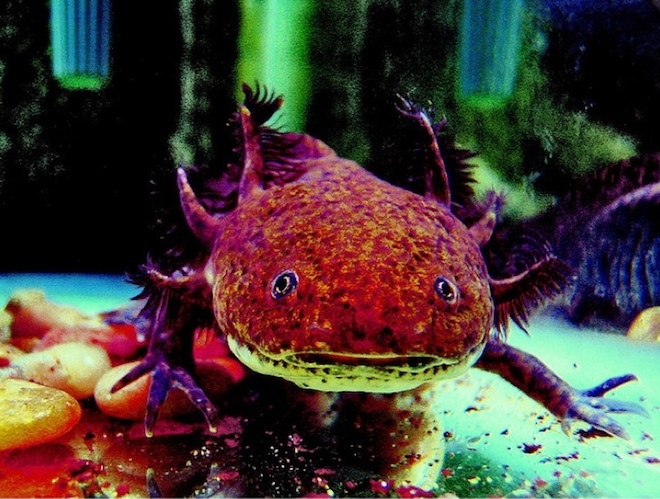 Some land vertebrates, including salamanders like the Mexican axolotl, still have electroreception. But in the change to terrestrial life, the lineage leading to reptiles, birds and mammals lost that electrosense and the lateral line. The researchers took the axolotl (to represent the evolutionary lineage leading to land animals) and the paddlefish (as a model for the branch leading to ray-finned fishes) to find out the history of this sense. They found that electrosensors develop in precisely the same pattern from the same embryonic tissue in the developing skin, confirming that this is an ancient sensory system. Also, the electrosensory organs develop immediately adjacent to the lateral line, providing compelling evidence “that these two sensory systems share a common evolutionary heritage,” said Willy Bemis, Cornell professor of ecology and evolutionary biology and a senior author of the paper. Bemis and his colleagues will now be able to build a better picture of what the common ancestor of these two lineages looked like.